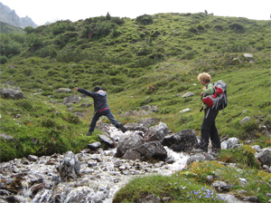 cabins/yurts – Tour Guide Mark – Let's Go Exploring! The day before our hike we enjoyed a night’s stay in one of the coastal yurts at an Oregon State Park. Playing on the beach that evening at sunset. The next day we began hiking from Yachats up the beach to Waldport. We crossed a number of streams that flowed across the sand and into the ocean. These little streams are wonderful for observing the dynamic power of water as it flows over and through the sand. 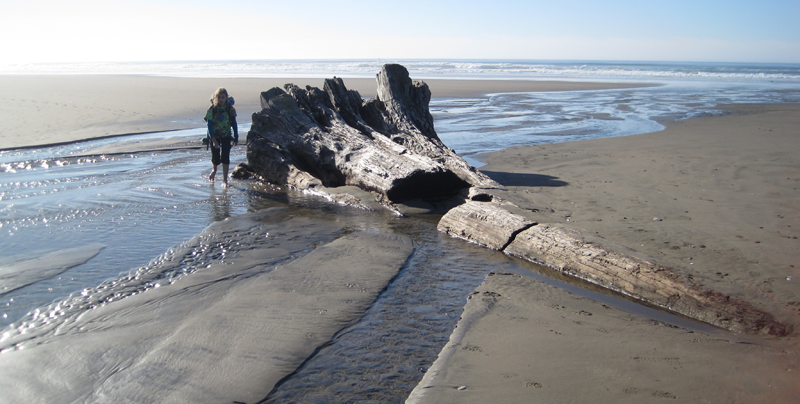 The beach was littered with driftwood, including this huge tree that had washed up. Enjoying a fabulous walk on the beach. The 129-foot Burney Falls in northern California is one of the state’s most beautiful waterfalls. The water does not simply pour over the top, rather the porous volcanic rock in the area encourages a dispersal of the water, resulting in multiple cascades that leap from the rock’s face along the entire height of the blue and white waterfall. The most popular vantage point for viewing is from the base of the falls, but this area can be crowded in the summer as heat-weary visitors find refuge in the coolness. A short loop trail allows visitors to explore both sides of the creek above and below the falls. However, if you are up for a larger hike try hiking a couple of miles of the Pacific Crest Trail, which passes next to the falls. The campground can be very crowded in the summertime, and the visitors, not the quietest. If possible, try visiting during a down season or mid-week. The Little Basin Cabins and Campground is a hidden location and perfect for escaping from the busy rush of Silicon Valley. This former Hewlett Packard employee retreat is now part of Big Basin Redwoods State Park in California and can be enjoyed by the public. 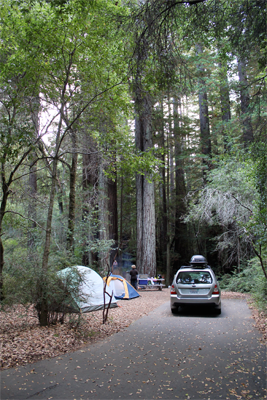 Our car pulled into the campsite where dappled light dotted an open space underneath massive redwood trees. A Jay stood like a sentry on the picnic table. We unloaded our supplies and scouted out two spaces for our tents. The Jay hopped into a tree and watched us closely. Our daughter explored the immediate area and found lost treasures of stick forts hidden among fallen redwoods. We pitched our tents, stored our gear and explored the larger campground. Little Basin offers 12 cabins and 38 well-spaced campsites among the redwoods for families who need some time to camp, play and explore. The park offers trails, and more developed facilities such as a children’s playground, group mess hall and sports field. 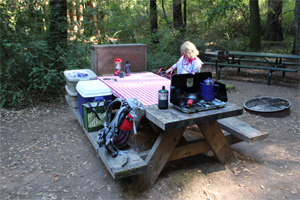 Each campsite includes a fire-ring and picnic table. Shower facilities are also available in the restrooms. Ice and wood are available at the camp office. As the sun lowered on the horizon we prepared our fire. My ten-year-old daughter is granted the privilege of being the keeper of the fire, a responsibility she takes great pride in. Soon a bed of coals was ready to cook our dinner and we placed our foil pockets with veggies and meat in the coals. As the sun lowered further the last lances of light shot between the great trees creating well-defined walls between shadows and light. The sun disappeared, it was dark on the forest floor but overhead the clouds were colored with pink, red and purple. We tore into our cooked pockets and enjoyed a cornucopia of flavors, it was a simple meal, but we relished it greatly. In the evening the temperature lowered and we donned our jackets. The light from the fire illuminated our faces and the trees immediately around us. We talked some, but mostly just stared into the flames and let our thoughts wander. It was very relaxing. Everyone was tired and we felt that it was very late. Someone announced the time, it was only 10:00 P.M. The TV show that we might have watched at home was not missed. At night we heard some chattering of raccoons outside, they were checking to see if we left some food out, we did not, and they left empty handed. Later, something stepped through the leaves, carefully and deliberate, it was a deer. In the early morning soft rain pelted the outside of our tents and at one point it rained heavy for about ten minutes. As morning broke we woke and enjoyed the quiet before others started their day. It was a few minutes of precious, even sacred time in the cool and stillness. The fire was restarted and the camp stove turned on to heat some water in our old, beat-up, blue enamel pot. Soon we had water for coffee. We stood around the small fire drinking coffee and chased off any chill that might have been in the air. The day began again and life was again renewed. A Jay, possibly the same one we saw the day before, sat like a sentry on a nearby branch and watched us closely. Little Basin is a new addition to Big Basin Redwoods State Park near Boulder Creek, California. In this time of recession, Little Basin is an experiment of sorts by the State of California and conservation organizations to allow Little Basin to support itself by being self-sustaining as a revenue generator while providing outdoor education opportunities to the public. After a beautiful 45 minutes drive from Innsbruck, our car turned off the highway and down a paved road marked with potholes and washboard asphalt. This was a very unusual sight, for the public roads in Austria are superb, but then I learned this was a private drive and shared by several farms. A short distance later we approached a sign with instructions for visitors to pay a €3 Euro toll. We stuffed some money in the box and continued on. Slowly the rough asphalt ended and became packed dirt interspaced with gravel. I would have enjoyed walking in this area for the mountain stream waltzed with the country road, allowing us to witness a dazzling display of brisk cascades, glassy waterfalls, and blue pools all framed against a thickly wooded forest. Our car stopped at a farm, we parked and gathered our backpacks. The trail was a continuation of the road, but here it was just hardened tire tracks that created a line that curved across the pasture and up the valley. At one point a number of honey bees buzzed past and smoke could be smelled in the air. Ahead of us, at the side of the road, were scores of bees hives. Some people were tending to the hives using smoke to calm the bees. The trail ascended up the valley for the next hour and then became very steep. For some reason, several cows had started to follow us up the hill. 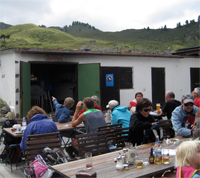 After a few heart-pumping minutes of walking a steep section, we arrived at the Adolf-Pichler-Hütte. 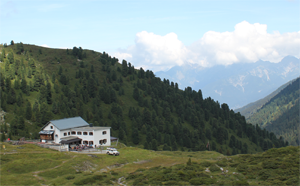 The Hütte is named in honor of Adolf Pichler, an Austrian writer, and scientist who lived in the 1800s. The cows were not far behind us as we arrived at the solidly constructed Hütte. 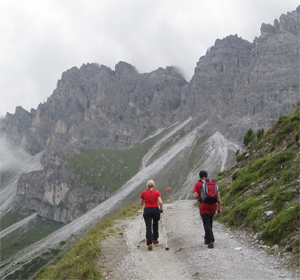 Those who traveled to this location had the most bejeweled natural spectacle to enjoy; in this Alpine valley the mountains, named Kalkkögel, soared perpendicular into the sky like enormous, jagged, stone knife blades rising several thousand feet higher over us. As afternoon approached – the clouds momentarily broke – allowing the sun’s light to gallop down the sheer rock face and instantly conquered the majority of the shadows on the mountain, only in the farthest of recesses did the darkness prevail. The interplay of light on the mountain face was magical, momentary and fleeting – the spectacle made one’s heart race – it was a moment of being alive. Everyone played in a small stream and explored some side trails. Several cows mooed in the distance then others, not far away, started to run, they disappeared over a hill. …Several minutes later we heard a clamor, the same cows crested the hill close to us and ran down in our direction, we gave them plenty of room, they ran passed and onto some unseen green pasture. It was late in the afternoon and we passed by the hut on our return visit. Other hikers had gathered to enjoy some late lunch. A table opened up on the small open courtyard and we enjoyed some drinks and soup. All the time enjoying the vistas that the valley offered. A black-faced cat, his grimaced expression formed from having a slightly recessed nose, indignantly walked around the tables and on the countertop before being shooed away. In a side barn was an oven, loaves of freshly baked bread sat on the top of the stove, ready to be devoured. We had some with our lunch, it was good bread. 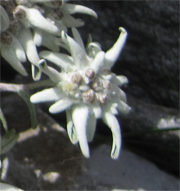 As we left I saw, in a garden pot, the most curious looking white flower – it was Edelweiss. The flower was soft and gentle on the fingers. 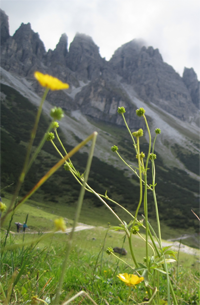 When you travel to Tirol you will see a multi-pointed flower drawn sometimes on signage, restaurant menus and embroidered onto clothes. This is that flower. Returning to the car I saw a classic looking motorbike parked nearby. 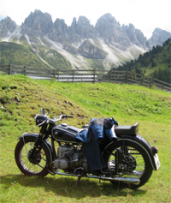 The bike, the farm setting, the mountains in the distance, the jacket laid casually across the seat…it was just cool. I had to snap a photo. What is the Name of that Giant Moth in My Cabin? We were asleep in a tent cabin nestled in the Sierra Nevada Mountains of California. In the still of the night, a visitor joined us. We awoke that morning and were greeted by a huge moth on the wall – almost 4 and a half inches across! What was it? The moth was beautifully colored in burnt red and adorned with white and black that sometimes gently blended into one another. It quietly sat on the wall, not moving. We inspected it closer and accidentally disturbed it causing it to clumsily flutter about the small tent cabin room. Interestingly, it found a resting space on a pinecone that was sitting on a small table. We carefully snapped a photo. We quietly dressed and departed for coffee and breakfast. The cool air embraced us as we opened the door and gave us a quick shiver. A light appeared as shafts breaking through the wall of tall trees that surrounded us. I understood why the moth found shelter in the moderate warmth of the tent cabin. When we returned to the cabin the giant moth had departed. We later read more, we had seen an adult Ceanothus Silk Moth. These handsome moths just live for a short time; their primary purpose is to find a mate and lay their eggs to continue their species, after which they die. It seemed harsh, but it was part of a natural cycle. We wished the giant moth good fortune in having a family. The short life of this moth provided reflection for everyone the rest of the day as we explored the woods. Source: National Audubon Society Field Guide to California. After a long day of driving to Kings Canyon National Park, the folks at GlyphGuy stayed in a tent cabin at the Grant Grove Village. We found that not having to unpack the car, set up a tent, or deal with cooking stuff was very convenient and welcome after a very long day – especially when kids are traveling in the car. Several types of cabins, including some with electricity and baths, are available but we had booked a basic cabin with no electricity. The cabin had two double beds and a small dresser for clothes. The walls were not insulated and the wooden frame ceiling was covered by a fitted tarp. The tarp had a patchwork of duct-tape squares to cover small holes. The cabin had several windows that could be covered with a curtain for privacy. A couple of warm looking blankets were folded neatly in a corner. Since our cabin did not have any electricity we were given a small lantern when we checked in. Although we had flashlights the lantern was convenient to have in the cabin at night. Nearby was a bathroom, segregated by gender, and several private shower stalls on the backside of the bath building. Grant Grove Village does provide a small restaurant with standard American fare for visitors and folks staying in the cabins. We were not sure what to expect with dinner so we had brought some food with us. We did visit the restaurant and found the food selection and prices were better than anticipated. Actually, the place was packed and people seemed happy with what they had received. Also located in the Village is a Post Office, a small grocery store and a gift shop. For those wanting to learn more about Kings Canyon and the Giant Sequoias, a visit to the Kings Canyon Visitors Center is a must. The Visitors Center is also in the Village. It offers several great exhibits, a short movie and lots of information about places to hike and explore. Check out the interpretive programs and make time to attend an evening campfire program held in the nearby outdoor amphitheater. The summer night was not as cool as we had expected and we did not need any of the extra blankets that had been provided. The non-electric cabins rent between $62 and $86 for the night. One item that needs improvement is a better knowledge of the history of the cabins. How old are they? Did any historical figures stay here? What is the story of this place? I asked three staff members variations of these questions and no one really knew the answers. The little bit of information I found was that the cabins were originally built in the 1940s and have been continually repaired over the years. It is obvious the well-worn door handle on our cabin had seen many travelers in its decades of service. Overall our cabin was clean as were the bed linens and towels. We found the staff working in the office and those working in the area of the cabins all nice and personable. If you are heading up Kings Canyon and need a place after a long drive you might consider staying in one of these cabins. Reservations are a must. Yurts are a comfortable way for families to camp. Recently my family needed a night out camping so we tried something new; we stayed in a yurt at Mount Madonna County Park near Gilroy, California. According to a park worker, the yurts are several weeks new. 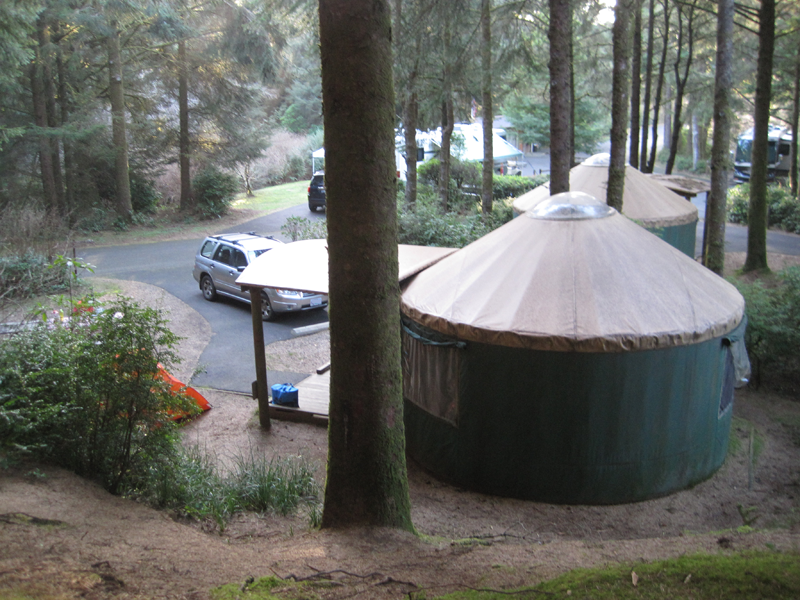 As we drove through the campground meandering between redwood trees we saw our yurt. It was tan in color, round and sat on a brown planked deck. We parked the car and walked just a few feet to the front step of the deck. The yurt had a front door and two side windows. On top of the yurt sat a bubble of clear plexiglass, it was a skylight. Unlocking the door we saw the yurt was clean and comfortable. The yurt’s diameter was 16 feet across, but it accommodated two bunk beds and a futon style double bed. In the middle of the room was a small, but a sturdy table. A lot of furnishings had been placed inside this deceptively small space. Above us on the ceiling was a light, which we later found good for reading just before bedtime. An external screen door kept out pesky mosquitos. For those who feel safer with it, a lock and deadbolt are located on the main door. Outside were a wooden picnic table and fire-pit. An odd shaped A-frame was nearby. This was for storing our food out of reach from raccoons. A few feet away from a large yellow banana slug slowly moved into the woods. The cost to rent the yurt was roughly double the cost of a regular tent campsite. The park does have showers and flush toilet facilities nearby. 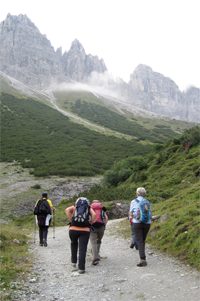 Several hiking trails offer hours of opportunity to escape the rat race and be outside. In the morning you will need to sweep out the yurt and tidy up so it is clean for the next family. My family needed a place to ‘chill-out’ and just kick-back for a night. If you are new to camping, have some grandparents who are joining you, or just want to relax without having to deal with a tent then check out yurt camping. We found it fun and relaxing.